You'll be £19.99 closer to your next £10.00 credit when you purchase Sailor in the Desert. What's this? At the outbreak of war, Phillip Gunn was serving on HMS Clio, a naval sloop fitted with sails and guns stationed in China and immediately tasked with hunting the soon-to-be-famous German cruiser Emden, but failed to prevent her escape. Gunn and Clio were next in action defending the Suez Canal against an attempted Turkish invasion before joining the expedition to invade Turkish-held Mesopotamia (Iraq). When the River Tigris became too shallow for Clio, Gunn took over a Calcutta River Police launch. He towed improvised gunboats to bombard the enemy in close support of the advancing land forces, whose assaults on enemy positions he witnessed. Though he repeatedly came under fire, it was malaria which finally struck him down during the pivotal Battle of Ctesiphon. He was fortunate to survive the journey back downriver. 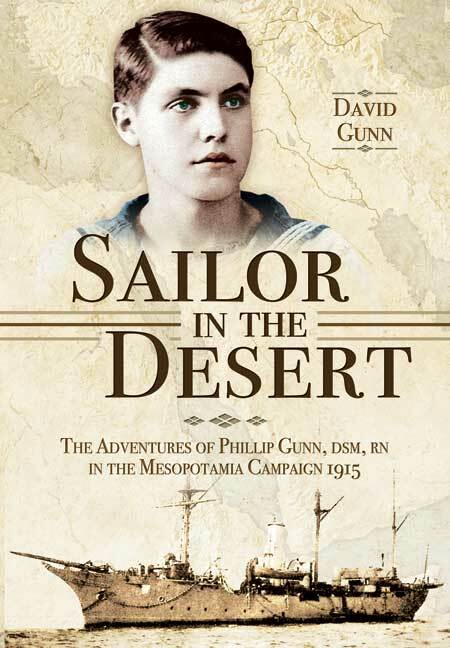 Sailor in the Desert is an authentic account drawn from Phillip Gunn's unpublished memoirs as well as conversations with the author, his son David. It is illustrated with archive photographs and colour paintings by Philip Gunn himself. As featured in the Cotswold Journal, Stratford-Upon-Avon Herald and Aberdeen Press & Journal. As seen in Discover Your History and Essence magazines. This is a fascinating account of one of the less familiar British campaigns of the First World War and the Navy's role in it. An account splendidly supplemented by Philip Gunn's own colour illustrations. [This book] deserves to be read by all with an interest in Maritime History, and in WWI in general. A very lively account of an oft-forgotten naval campaign. Extremely readable and provides a succinct, and at the same time very personable, account of the first, successful part of a campaign that later turned sour, before ultimately succeeding. Recommended. Philip Gunn's paintings – of which there are a number in the book – are now part of the British National Art Collection. They make this a special book in itself. David's colourful telling of his father's story makes it extra special. In 1940, following the fall of France, there was real concern that Great Britain could be invaded and Winston Churchill set in train the organisation of a form of “stay behind” army. Created by Colonel Colin Gubbins this was a force of civilian volunteers who would operate behind the invading enemy’s lines. Working from secret underground bunkers their mission would be to sabotage, and attack, enemy targets such as airfields, supply dumps and lines of communication. They were known as Auxiliary Units and, although having been formed to help combat an invasion, were not disbanded until 1944. John Warwicker has spent several years researching these Auxiliary Units and written a fairly comprehensive history of them although in some circumstances it seems more questions are raised than answered. He makes it quite clear in his Foreword that it is a keynote account which helps to explain why, at times, the content of a chapter does not always seem to follow on from the previous one. This book is worth reading if only to become aware of the infighting between some government departments but more so to get an idea of how resourceful people were not only willing, but keen and eager to serve their country as civilians under conditions of extreme secrecy. Illustrated with archive photographs and colour paintings by Phillip Gunn himself, the book provides an unusual and timely naval perspective on a neglected World War One campaign as the centenary fast approaches. An excellent mix of the political and military history of the time during an often overlooked battle against the Turks in the Middle East during late 1915, and the experiences of a junior rating, Able Seaman Phillip Gunn, given amazing responsibilities during actions 500 miles from the sea up the River Tigris near Baghdad, and his lucky evacuation from being incarcerated in Kut where thousands of British and Indian troops were not so fortunate. Good descriptions of the historical setting, key political and military players on the world stage on the one hand, and on the other, Gunn's experience on shore leave near Basra drinking coffee in a street cafe talking to the local Arabs, asking, "What do you think of us being here?" and being told, "the Turks have ruled us for hundreds of years, and want to make money out of us. ... You will probably be the same. ... We just want to be left alone". Good maps, contemporary photographs and coloured illustrations by the subject of the book painted years later from memory - make a most readable and entertaining package. Few people today know that the Royal Navy fought the Turks in Iraq during the First World War. One who did know was Captain Phillip Gunn, DSM, RN, ARNO chief executive from 1946-52. He left an unpublished record of it which has now been turned into a book... recently published by Pen & Sword. David Gunn is a former Royal Navy officer, Fleet Air Arm pilot and TV newsreader. He is also the son of the subject Phillip Gunn. He lives in the Cotswold Hills, England.